A year ago I saw a lovely map entitled 'Biscuits' (cookies, but way way better, for my American friends). 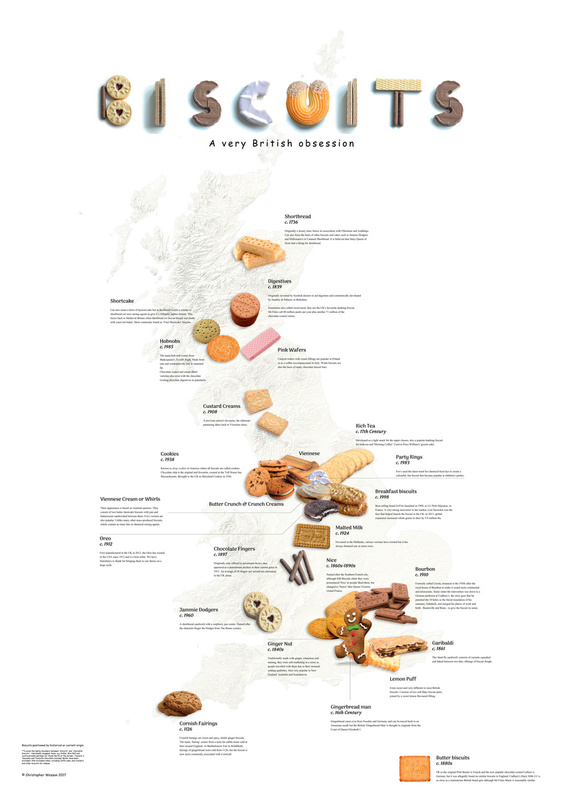 Made by friend and talented cartographer Chris Wesson, it was a quirky but really interesting way to look at 'a very British obsession', to geo-locate classic products and provide a little explanation. I liked it. And, as tends to happen when I peruse map galleries an idea popped into my mind. Since I've lived in the US, whenever people ask me what I miss about the UK my standard retort has always been 'cheese and electricity'. (actually, the real answer is my family and friends but that seems boring and wouldn't get a laugh). Cheese, because, let's be frank...cheese in the US is utterly awful. Tasteless plastic nonsense. And the electricity - at 120V is half-powered. Almost impossible to toast a piece of bread in anything under 10 minutes and the only benefit being you really don't need to switch off the mains to do home repairs. I forgot once in the UK and got thrown off a ladder with a charred forearm...proper 240V electricity. I digress. I decided to give myself a year to plan the project. It turned out this was a necessity. 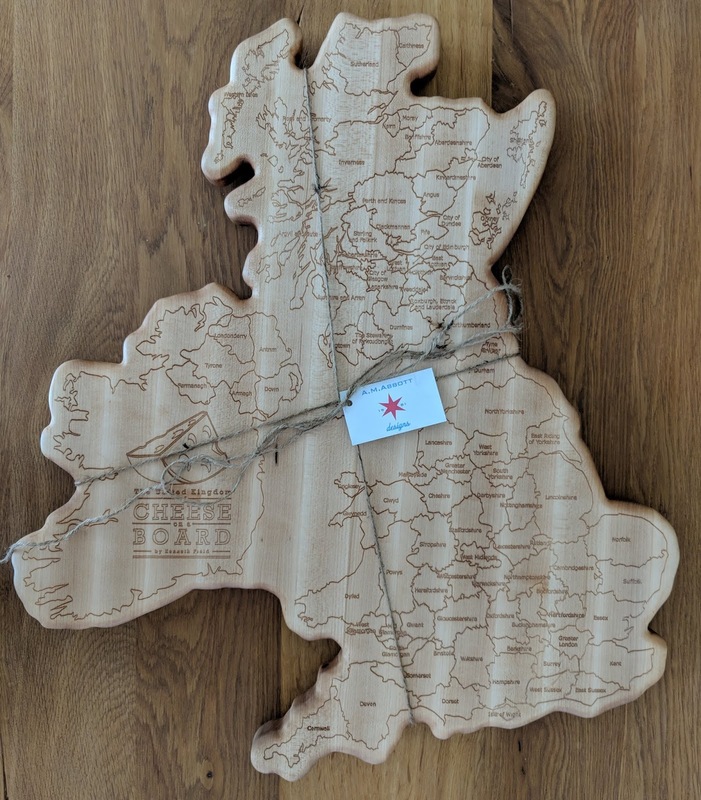 The first problem was sourcing a cheese board in the shape of the UK. They don't exist despite extensive searching. So I decided to just make one. I made the map in ArcGIS Pro using data representing the ceremonial counties of the UK (that's the United Kingdom of Great Britain and Northern Ireland). I was targeting it as an exhibit at the UK Mapping Festival in September 2018 so the map had to be the UK. 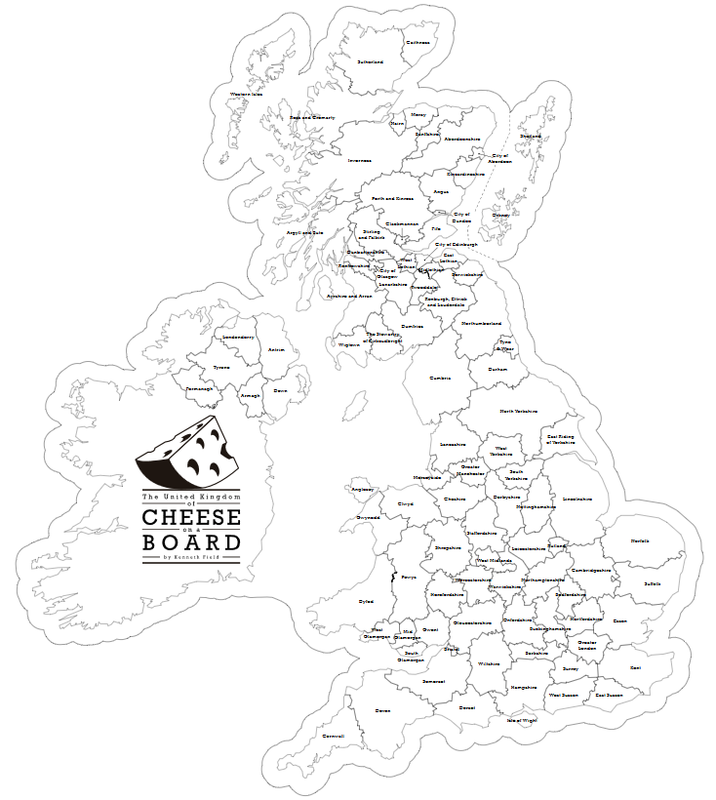 The original idea was to make a jigsaw out of cheese on top of the map. 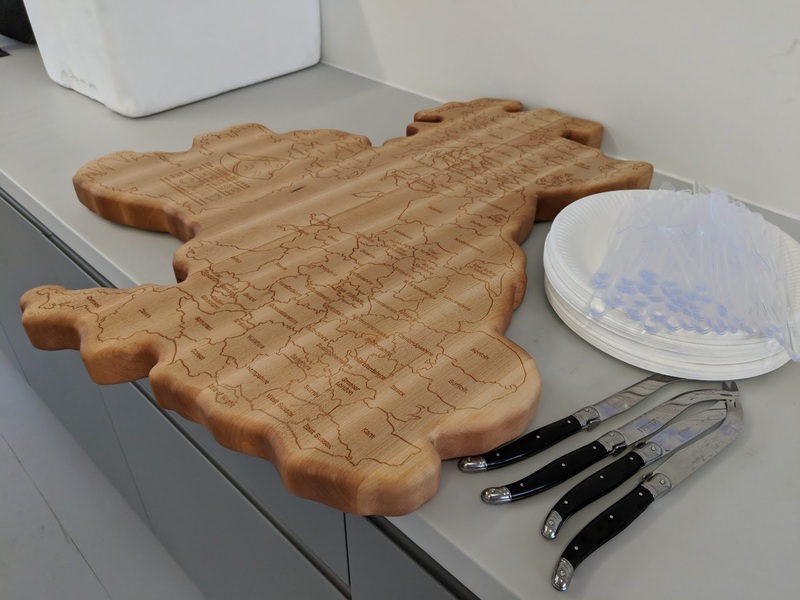 Each county represented by a piece of cheese that would be cut into the shape of the county. 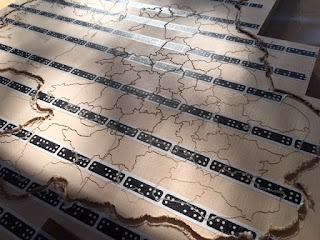 As the cheese is eaten, the map underneath emerges. 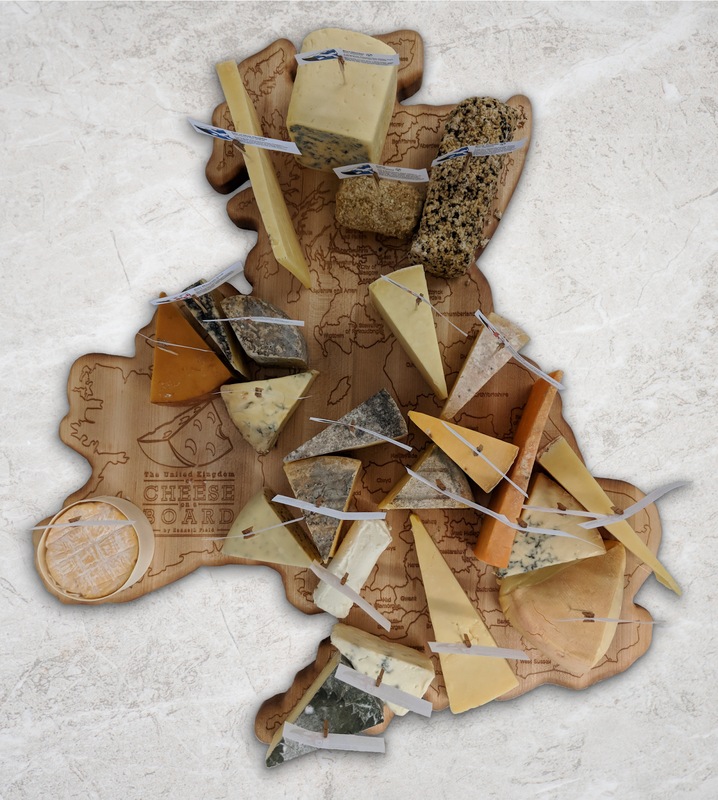 Except, despite there being over 770 different UK cheeses the Modifiable Areal Unit Problem and boundary lines stymied my idea. There were some very large areas with little or no cheese production (particularly in Scotland and the East of England). Some cheeses, being very soft, would not be easily cut to shape. And the modern administrative map of the UK contains all sorts of weird and wonderful counties and Unitary Authorities. Ugh! So I went with ceremonial counties. The jigsaw of real cheese idea still wasn't going to work as there would have been over 136 tiny pieces of cheese on the board and a hell of a lot of waste considering most cheese is sold in a minimum 250g size. 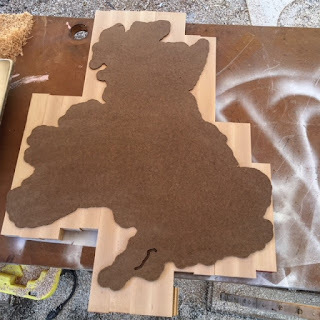 The map was designed and I was originally going to make it myself but it soon became clear I didn't have the correct tools. 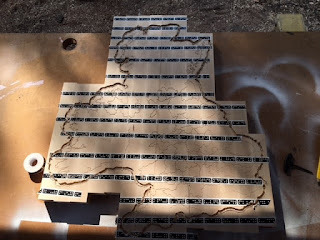 I found Andrew Abbott, an experienced artisan woodworker who had the required tools - a CNC router and a laser engraver - and the willingness to help me with my crazy idea. Over a period of several months I worked closely with him here in California to make the cheese board. We discussed wood types and settled on Maple. I iterated the design and gave me good advice on what would and wouldn't work. He glued laminate maple blocks together and set to work. He worked from svg output from ArcGIS Pro to drive the machinery and he finished the product by hand, and stained the Maple wood to a beautiful finish. 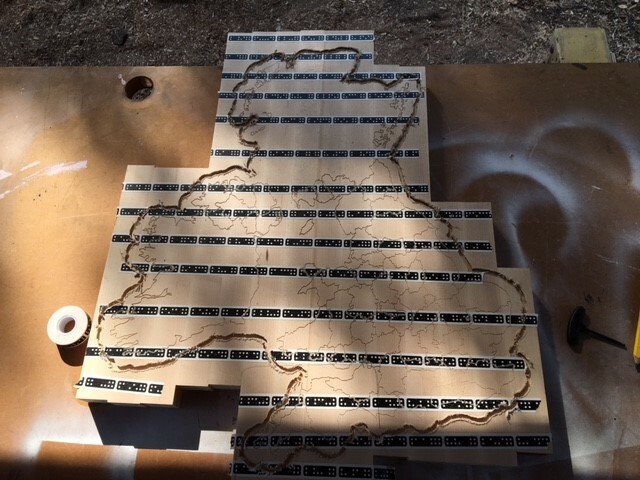 Here's a few pictures of the board in various stages of production. It's a metre tall and about 80cm wide at its widest. it's a big board capable of holding a lot of cheese! There weren't too many design decisions because the map is really just administrative boundaries and labels. But a couple of fun dilemmas. What to do with the Isle of Man for instance? It's a self-governing Crown dependency and not part of the UK yet it would be silly to leave it off the map. I was going to get a hole cut in the board in its shape but the potential for cheese to fall through the hole was too much. In the end I just didn't label it. And what of boundaries in the Republic of Ireland? Well - I chose to remove them as the Republic is also not part of the UK and, instead, used the space as a perfect place for the title cartouche. I didn't label it either. I have had one person get somewhat annoyed about my apparent ignorance for the Republic but that was my cartographic editorial decision. Tough. And the biggie...at a time when debates were raging about the position of Shetland and Orkney in inset maps what the hell should I do? They are too far removed from the mainland to be cut in their real position. the wood would not have held and it would have necessitated a large expanse of nothing. Yeah, there's some very small local cheese producers on Shetland but not enough to warrant a huge proportion of Maple all for itself. So I opted for an inset and the islands now occupy the coastal area off eastern Scotland. A pragmatic decision but one which was preferred to the only other viable option - leaving them off the map altogether! Actually, after the cheese board was produced John Nelson suggested Shetland and Orkney could have been a floating olive dish. I still might get my jigsaw out and set them loose. John has a strange relationship with olives. You should ask him some time. So, turning attention to the cheese. 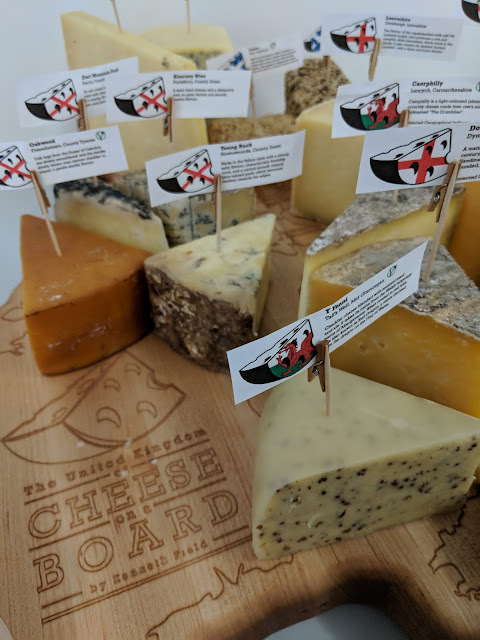 The criteria was simple...fill the board, make the cheese as geographically located as possible, and get a good mix of the classics and the rare, and of different styles. There were also a small set of around a dozen cheeses with European Union 'Protected Geographical Indication' and 'Protected Destination of Origin' designations. These were important and should be sourced. Whittling down a list of over 700 cheeses and sourcing the cheese became a challenge. I had an initial list of around 60 and was aiming for around 30-40 cheeses. And here's my top tip for anyone thinking of doing this...phone suppliers, work closely with them. Ensure that they will have product and can ship it to arrive on a particular day. Don't get too wedded to having a specific cheese as it may be only available seasonally. I eventually settled on a list of 30 cheeses, sourced from six different suppliers that met the criteria, were available, and would fill the board fairly well. I'll not bore you with detailed logistics but given I live in California the cheese had to be delivered to my brother Colin's house in Lincolnshire and he (and my wonderful nieces Isabella, Amelia and Eloise) then drove the cheese down to London ahead of the conference event at which it was going to be displayed and devoured. Keeping it cool and fresh was paramount. My hotel room then began to get a little whiffy for a day or so and the mini-bar fridge was somewhat rammed with around £400 worth of cheese. And how did the cheese board get from California to London? That'll be British Airways allowing me an additional bag as part of my frequent flyer status. Very handy, thanks! So the United Kingdom on a Cheese Board was then transported and set up at the #geomob event on Thursday 7th September at the Geovation hub in Clerkenwell, London. Each piece of cheese was topped with a small sign indicating its origin and history. Unfortunately 7 pieces didn't make it. They had been delivered to my brother's house simply too early and were no longer in an edible state. We ended up with 24 cheeses all told and that turned out to be just about right to fill the board. 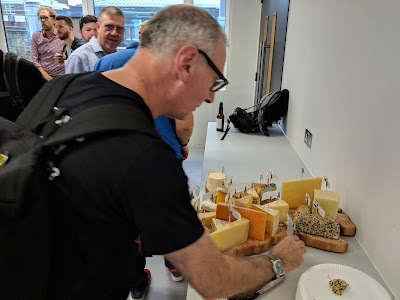 Around 50-60 geogeeks and map nerds were in attendance for the evening talks and the cheese board was very much a star attraction. 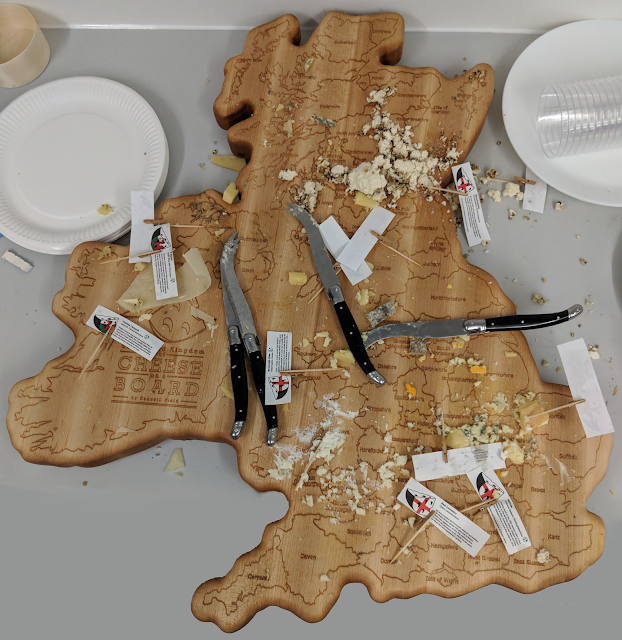 With wine supplied by friend and colleague Ben Flanagan (and thanks to Esri UK) we had a glorious spread of cheese, biscuits and wine to wash down the geotalks and a good evening was had by all. Here's a selection of photographs from the evening itself. Footnote...I'd contracted a gastrointestinal 'issue' in Tanzania the week before and so I didn't actually get to try any of the cheese myself. Very disappointing. And what's that you ask? My favourite cheese? Gotta be Stilton from Cropwell Bishop or Colston Bassett in my home county of Nottinghamshire. Perfect! Maps are my passion and my profession. This is my personal cartonerd blog where I offer opinions and critique maps. Serious points with a good dose of British sarcasm. Do not be offended. It's about the maps, not you. Views entirely my own. Kenneth Field. Simple theme. Powered by Blogger.